The now-defunct Starter Edition was cheaper than the Standard Edition but base game content had to be unlocked and took about 5 times longer to unlock operators (see the Starter Edition FAQ for details). All Starter Edition owners have now been upgraded to the Standard Edition version of the game, as of Y4S1. The Standard Edition all Base Game Ops are at a low cost, ranging from 500 to 2000 renown depending on how many operators from the CTU have been purchased. The Advanced Edition contains the base game, 10 Outbreak cosmetic packs, and 600 R6 Credits. The Gold Edition contains the base game and the first season pass (Buck & Frost, Blackbeard & Valkyrie, Capitao & Caveira, Echo & Hibana) and 600 R6 Credits. The Gold Edition - Year 2 contains the base game, the second season pass (Jackal & Mira, Ying & Lesion & Ela, Dokkaebi & Vigil & Zofia) and 600 R6 Credits. The Gold Edition - Year 3 contains the base game, the third season pass and 600 R6 Credits. 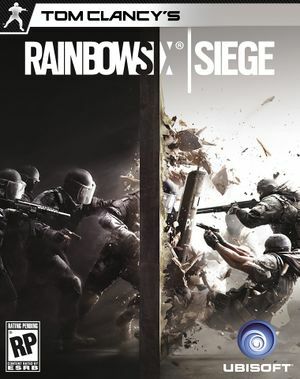 The Complete Edition contains the base game, all three season passes and 600 R6 Credits. Available for free. Requires 36 GB of HD space. See the DLC Steam page for a download link. Delete or rename the startup folder. Delete or rename nvlogo_1280x720 and ubilogo_1280x720. replace nvlogo_1280x720.bik & ubilogo_1280x720.bik with empty files which have the same name. 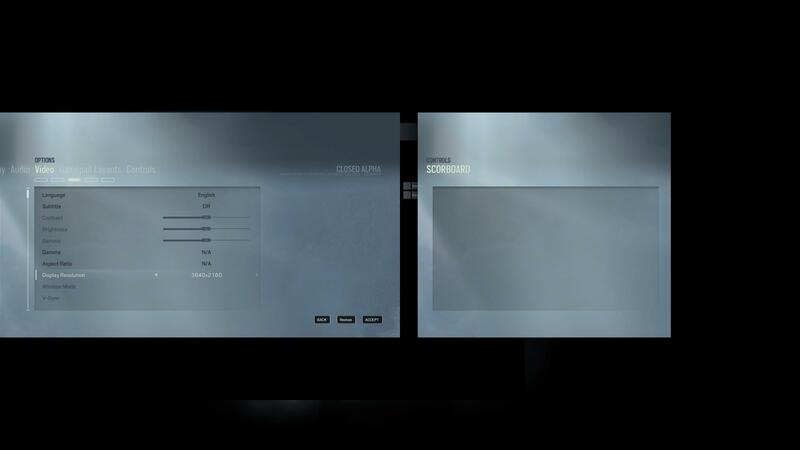 Key bindings and player profile. 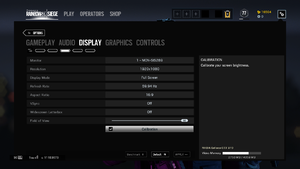 Selecting 4K glitches the menu. Reduced aiming speed in ADS on/off. Can be set to 1:1 while ADS using AimDownSightsMouse=100 and XFactorAiming=1.000000 in the config file. 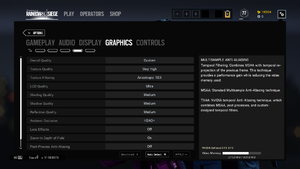 XInput and DualShock 4, may have problems with Steam Controller. Aim assist, vibration, full customization. 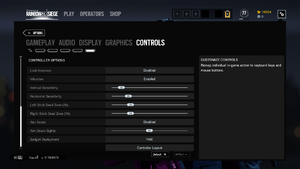 Uplay prompts requires XInput controller or keyboard/mouse. Limited to 2 presets; Default and Southpaw. Static blue if unused, health from green to red when playing. You need to log in the Uplay account (or Steam and Uplay if you have Steam account) first. 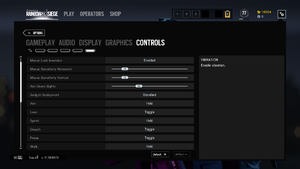 Set Voice Chat Record Level to your preferred microphone gain. Issue is caused by UPlay Overlay not starting correctly. 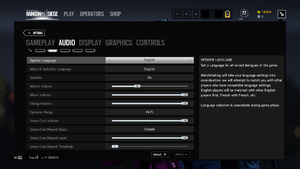 Overlay may be enabled but might not be activated in-game (with ⇧ Shift+F2 by default). Issue is caused by Raw Input. Vivox SDK Used for voice chat. Scaleform Part of Autodesk Gameware suite. ↑ 1.0 1.1 File/folder structure within this directory reflects the path(s) listed for Windows and/or Steam game data (use Wine regedit to access Windows registry paths). Games with Steam Cloud support may store data in ~/.steam/steam/userdata/<user-id>/359550/ in addition to or instead of this directory. The app ID (359550) may differ in some cases. Treat backslashes as forward slashes. See the glossary page for details.